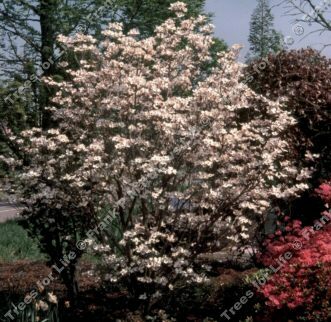 Rainbow (Cornus florida 'Rainbow') is a handsome North American Flowering Dogwood variety. Of particular interest are its colourful yellow marginal leaves. Its flowers are a delightful white colour. Like other dogwood varieties, Rainbow exhibits really dramatic autumn colours. This tree is supplied at a height of between 1.3 and 1.8 metres in a 7-12 litre container for year round planting and better results than from either bare-root or rootballed stock.